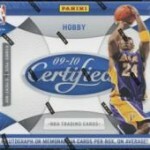 Blog Homepage \ Dave and Adam's Buying Team Stories \ Massive Upper Deck Commemorative Sheets Purchase! The buying team here at Dave & Adam’s recently acquired a large lot of early 1990’s Upper Deck commemorative sheets. Due to the age and nature of how they were given away, many of these sheets are incredibly tough to find! Our buyers jumped at this opportunity, as some of these sheets have never been seen before! It took us awhile, but we have fully processed all of these commemorative sheets and they are now available for purchase! 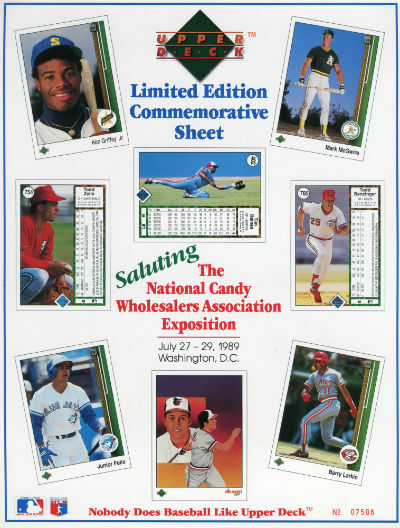 The grail of theses sheets is by far the very first one Upper Deck made – commemorating 1989 Upper Deck Baseball and released at The National Candy Wholesalers Exposition held in Washington, DC on July 27th-29th of 1989. Pictured on the sheet is Ken Griffey Jr., Mark McGwire, Todd Zeile, Junior Felix, Barry Larkin and Todd Benzinger. The Griffey card is, of course, his 1989 rookie card design! Upper Deck made 12,000 of these sheets and, as mentioned above, it represents the start of Upper Deck Baseball! Upper Deck also partnered with many teams/stadiums to stage the Heroes of Baseball exhibition games in 1991 and 1992. These games featured stars and players from across the MLB and every decade from the 1940’s up to, and including, the 1980’s! Upper Deck created a variety of sheets that were used as giveaways across the country! There are also sheets from Upper Deck’s foray into the NFL and NHL landscapes. We have All-Star games, All-Rookie Teams, Championships, and more great moments all captured on these collectible sheets! The sheets we have acquired range from the years 1989-1994. Each sheet measures approximately 8 1/2″ by 11″ and is printed on heavy card stock. The sheets have an Upper Deck stamp indicating the production run and an individual number. Most backs are blank but there are some with Upper Deck Limited Edition Commemorative Sheet emblazed multiple times on the back. 1989 Upper Deck “The First” Limited Edition Commemorative Sheet featuring Ken Griffey Jr Rookie! These Commemorative Sheets are a cool memento for any collector, particularly if you were lucky enough to attend one of the events where they were originally handed out! Did you miss out on getting a sheet then? If so, now is your opportunity to pick one up! 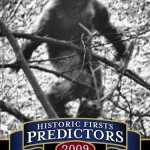 Big Foot and Aliens Sited at Upper Deck! Win a Limited Edition Upper Deck Gale Sayers or Bobby Orr Autographed Card!